30 miles north of DC, Montgomery County is trying to build a new kind of suburb in Clarksburg, one that looks more like a small town and where residents don't have to drive everywhere. It hasn't totally worked. 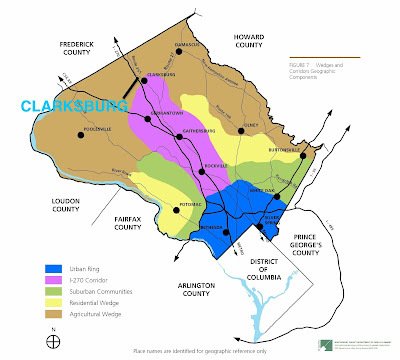 But Clarksburg might actually have something to teach closer-in communities about how to grow sustainably. Urbanism! All photos by the author unless noted. Maybe that’s a little rich. I will say that Clarksburg is somewhat different than what we traditionally conceive of as a suburban community: big houses, big lawns, and lots of driving. As Montgomery County's older suburbs try to create the walkable, transit-oriented places that people increasingly want, Clarksburg might offer a few lessons. In the 1960s, Montgomery County created the “Wedges and Corridors” concept, which basically laid out how the county would grow over the next 50 years. 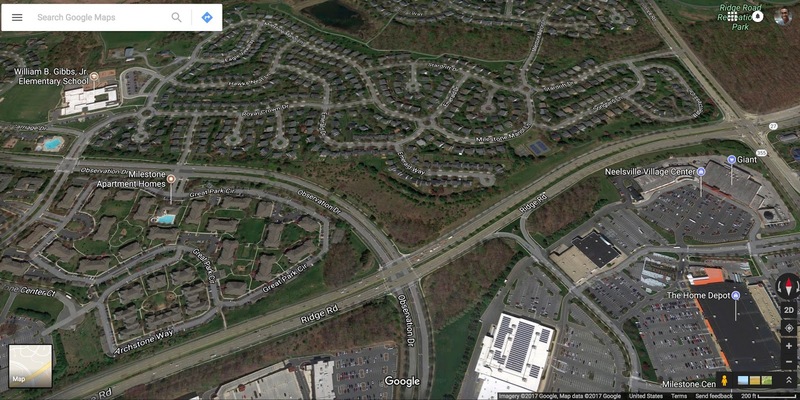 It broke the county up into four parts: an “urban ring” inside the Beltway, containing commutes like Bethesda and Silver Spring; two “wedges” on either side of I-270, containing suburban areas; and a “corridor” along I-270 itself, with five “corridor cities” along it: North Bethesda, Rockville, Gaithersburg, Germantown, and Clarksburg. At the edges of the county, one-third of its land would be set aside for agriculture. The "Wedges and Corridors" plan. Clarksburg is near the top of the map. Image from Montgomery County Planning Department. As the northernmost “corridor city,” Clarksburg was basically rural until 20 years ago, when county planners laid out a plan for how it would develop once the suburbs finally caught up. They envisioned a walkable town, with compact neighborhoods of townhouses, apartments, and houses on small lots surrounding a little downtown with shops, public buildings, and a square. A new rapid transit line, the Corridor Cities Transitway, would connect it to Germantown, Gaithersburg, and the Red Line. "We have been adamant that we do not want the center of town to be a shopping mall," resident Jeane Onufry told the Washington Post in 1991. That didn’t totally pan out. The Corridor Cities Transitway isn’t funded, and the only bus service that exists today comes at rush hour. The downtown is still an empty field, and a massive shopping mall did actually get built a mile away. Some of the bigger roads aren’t very walkable. In one instance, students have to ride the school bus to a school across the street because the county won’t put in a crosswalk. Thousands of site plan violations created a huge controversy around the development. But the vision of compact, mixed neighborhoods has come true in parts. And they actually work kind of well. Here’s why. Part of Germantown (top) and Clarksburg (bottom) at the same scale. It’s actually kind of walkable. Here’s an aerial of Milestone, a pretty typical 1990s subdivision in Germantown. 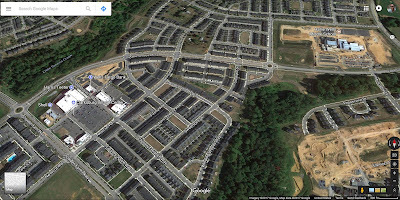 There’s a mix of different things here: single-family homes, townhouses, apartments, a school. and a shopping center. But the roads are big and circuitous, and it’s really difficult to walk from one thing to another, even though they’re all close together. Compare that to this section of Clarksburg Village, one of the new subdivisions in Clarksburg. All of those same components are still there, but they’re connected by a network of nice, tight streets with sidewalks and crosswalks and blocks. You can walk here, comfortably. A "pocket park" in Clarksburg. There are lots of good, usable open spaces. Some of them are pretty modest - a little shared green in front of several houses - and some of them are big enough to have playing fields and community buildings. What they have in common is that they’re designed as usable spaces. There are lots of paths connecting them to houses and nearby streets. Most spaces are big enough for some passive recreational activity. And while you might see some landscaping or a playground, there's enough empty space that they're flexible for whatever residents want to use them for that day. Most new streets in Clarksburg have sidewalks. It shows how homes can mix together. In Silver Spring, neighbors fought a proposed townhouse development because they felt it wouldn’t fit in with their stand-alone houses. Yet 30 miles away in Clarksburg, apartments, townhouses, and single-family homes of different styles and sizes happily coexist on the same block. You might argue that this is a new neighborhood, and it was planned to be this way. That’s true. But it’s also a return to the past in some ways, as the very oldest sections of Montgomery County have a similar mix. The results are neighborhoods that fit many people’s needs, regardless of income level, lifestyle, or personal preference. Clarksburg is really, really diverse. One result of having such a fine-grained mix of housing is that people of different backgrounds or income levels can actually live here and feel welcome. The 2016 American Community Survey found that Clarksburg is majority-minority, as are all of the public schools. Neighboring Germantown was ranked one of the most ethnically diverse communities in the nation. Part of why these communities are so popular is because of the urban-ish lifestyle they promise. It’s a lot cheaper than the alternative (closer-in, historically urban communities). It’s also really hard to build the townhomes or stacked towns you see in Clarksburg in a closer-in place like, say, Silver Spring. For instance, it took five years from start to finish to build Chelsea Heights, a development of 63 townhouses in downtown Silver Spring. During that same period of time (2010-2015), Clarksburg added over 2,000 homes and 8,000 residents, according to the American Community Survey. While downtown Silver Spring has added a lot of rental apartments, there are very few homes for sale, pushing house prices up. That forces out anyone who might want to buy a home, sending them to places like Clarksburg instead. And that has consequences. This development gobbles up farmland and creates pollution. It requires people to drive long distances to work and other activities. And it requires millions of dollars in public spending to build new roads, schools, and fire stations. If we as a county don't want to bear those costs, we have to make it easier for people to live closer in. That means neighbors can't keep fighting new homes in their neighborhood. And it means allowing new homes in a variety of types and styles and price ranges. That's one thing Clarksburg is really good at.